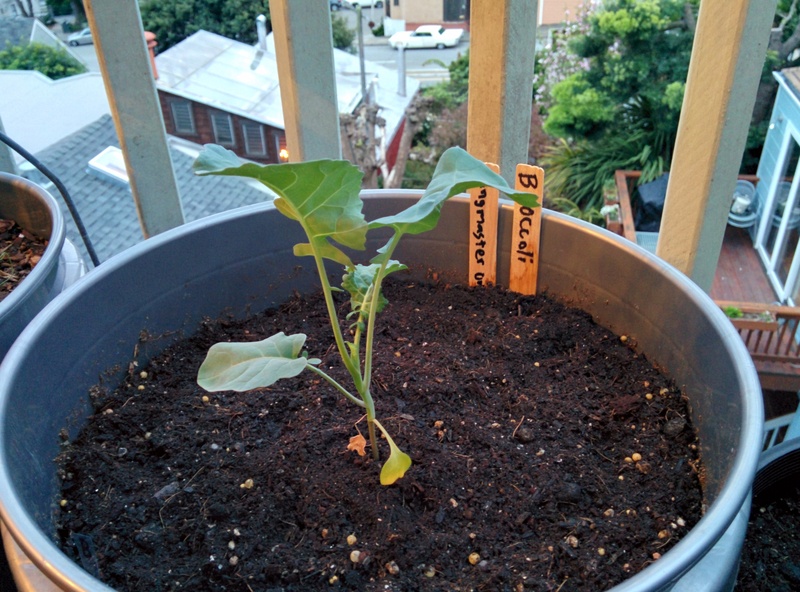 The 2014 balcony and indoor garden has been coming together well so far. Instead of a ton of varieties of tomatoes, we’re adding some variety to see how other stuff grows that we would like to eat. The increase in the quantities of seeds we now posess have necessitated a trip to Daiso to spend $4-5 on storage supplies. You never know exactly what you’re going to come away with when you go there, but you always know there will be a few options that meet your needs. So I was able to find a small binder designed for trading card collections, a lot of small plastic bags perfectly size for the slots, and another organizer to put the other miscellaneous seeds in. I love having a Daiso around. 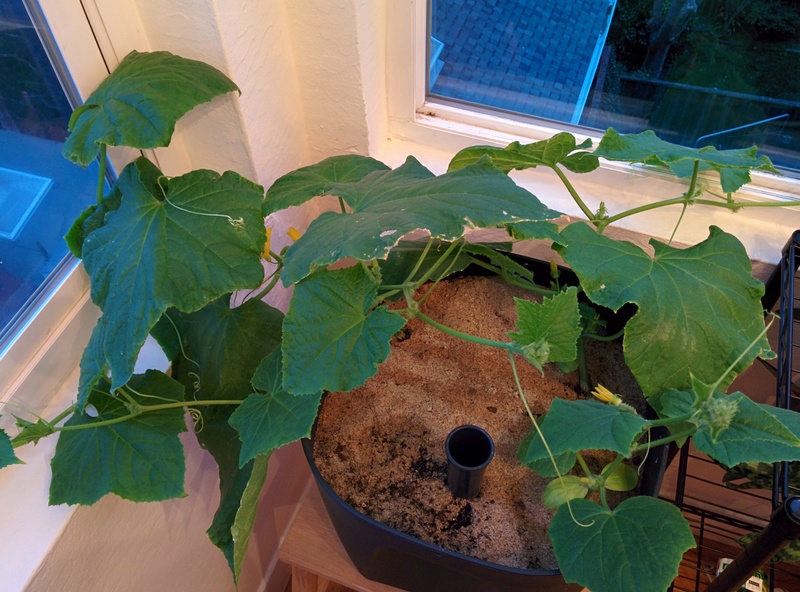 Since the indoor garden doesn’t have the same limitations as growing outside, we have had the Spacemaster Bush Cucumber growing for 7 weeks now. It’s male flowers have started blooming and I have been collecting the pollen on a q-tip for later pollination when the female flowers start blooming. This variety is supposed to be more compact and bushy so hopefully it will work great indoors and not need to crawl too much. We have also had broccoli (Coronado) and cauliflower from the Botanical Interest’s Chef’s Choice blend (it’s either ‘Snowball Y’, ‘Green Macerata’ or ‘Purple of Sicily). Whichever variety it is will be a surprise when the head starts to form. They are both at 7 weeks as well. Since there is limited space and only so many buckets I am also trying some companion planting practices so in each of the 3 buckets there is a different variety of onion. 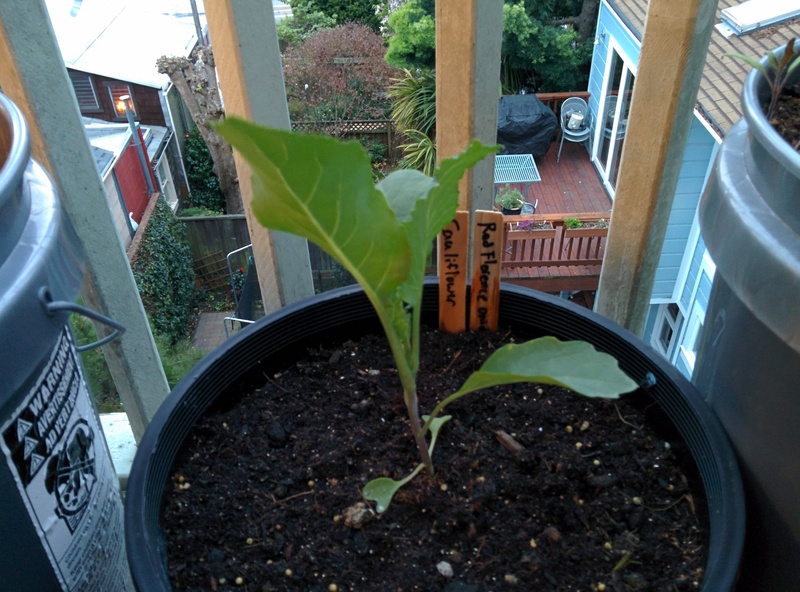 Onions are a beneficial plant for broccoli, but I couldn’t find an instance of onions being beneficial for cauliflower, but it’s not harmful, so I planted it anyway. The three varieties are: Ringmaster Onion, Italian Red of Florence Onion, and Flat of Italy Onion. They have only been planted recently, so they’re not visible in the photos. Another companion planting that is more traditional and symbiotic is the 3 Sisters method where you plant corn, peas, and squash together. The varieties are Mr Big Pea, Super Sugar Snap Pea, Buttergold Corn, and Dirana Lebanese squash. 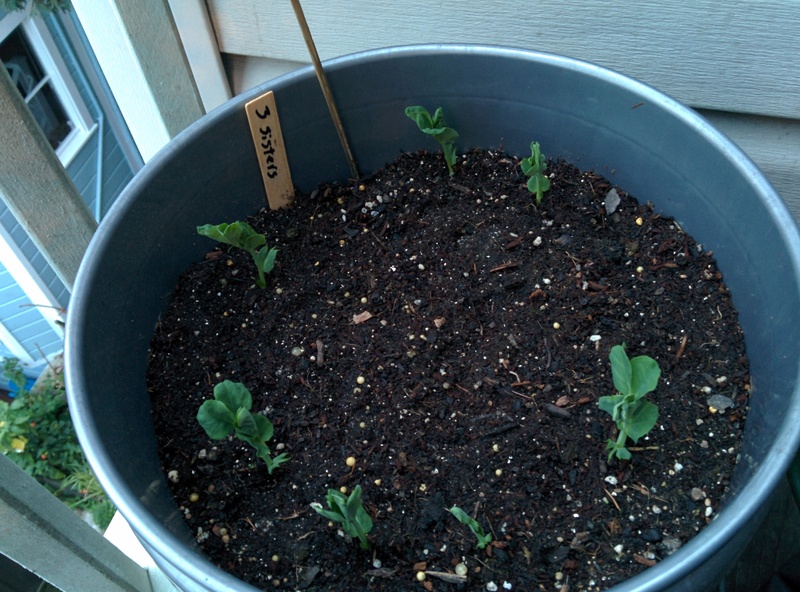 I am doing one pot of that, so far only the peas have broken above the soil line. It’s been 2 weeks since they were planted, so the corn and squash should have come up by now, so I need to dig around and see if they germinated or not and plant more. For outdoor tomatoes I will be growing Azoychka again this year. Blue Beauty, Japanese Black Trifele, and Russian Roma are new varieties. The biggest change this year is I am going to be grafting all my tomatoes onto disease resistant rootstock. I will have a post dedicated to grafting when I have more experience with it. If I’ve learned anything about this mild climate, it’s that you can’t get away with disease free tomatoes, so might as well prevent them the best way possible. For indoor tomatoes, I will be growing (or have already been growing) New Big Dwarf, Silvery Fir Tree, and Sophie’s Choice, and maybe Sasha’s Altai. They will also be grafted. I have already grown New Big Dwarf, Sprite and Sophie’s Choice inside, but they weren’t grafted and succumbed to disease. We got about a pound of ripe tomatoes off of Sprite, but they were thick skinned grape tomatoes and not that flavorful. All of these were supposed to be in the 2-3′ range, but all of them ended up being over 4′ which is disappointing because they become unmanageable indoors and the varieties were chosen specifically for their size. I might need to find a different source of these tomato seeds because I am questioning the purity of the seeds I buy given the results from many varieties from one particular vendor. The Blue Beauty Tomato is a new variety developed by Wild Boar Farms. They crossed the Indigo Rose Tomato with Beauty King to create it. It is a naturally bred tomato developed to generate anthocyanins when ripe and exposed to direct sunlight. 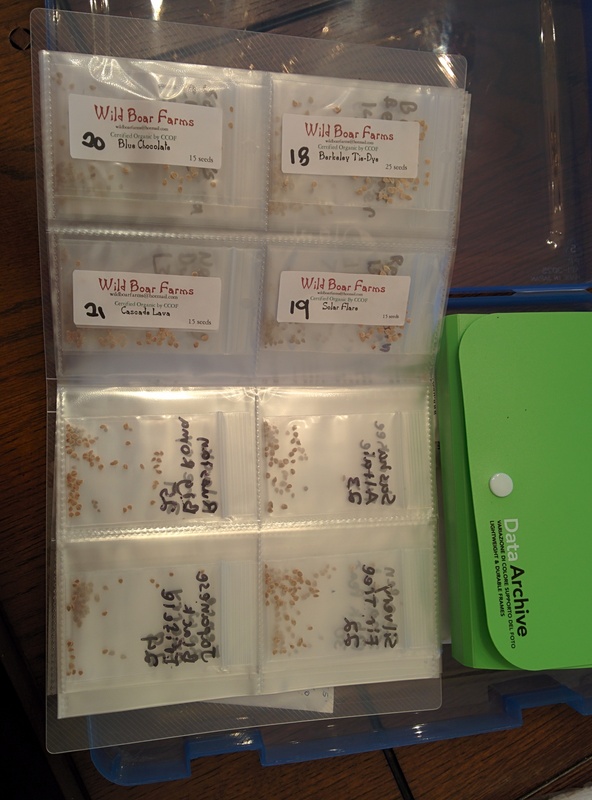 I bought several other varieties from Wild Boar Farms to grow later on. I’m quite excited with the stuff they are doing. Great post, keep them coming. I’m looking forward your post on crafting.